I’ve always felt one of the downsides of the CD medium is the amount of data they can hold. Many performers feel the need to maximize the content…stuff that silver disc to the gills with as much binary crappola as technologically possible. Never-mind the fact that 50% or more is useless filler, if they have the darts, they gotta throw em all at the dart board. 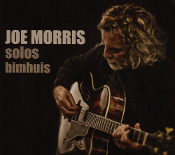 Luckily for the listener of Joe Morris’ Solos Bimhuis collection, the filler factor is pretty much absent. What we have here is 7 long pieces, ranging from 6 minutes to a ginormous 26 minutes. One man, one acoustic (sounding) guitar…and a whole lot of notes. Listening though this huge set, I was constantly amazed at the frequency of ideas that must have been pouring out of JM’s head. The fact that he seemed to be able to process these ideas faster than a Cray astounded me. There was some serious number crunching happening. Using a multitude of extended picking techniques…moods, atmospheres, hell, even fully fleshed out novels were seemingly created in an instant. Some that he showed us early on were revisited, only twisted and turned inside out creating yet further ideas. My experience to all this was one of surrender, letting go and finally full engulfment into the sonic maelstrom. Spanish themes occasionally popped their heads up only to be quickly supplanted by what sounded like a vicious bowing technique of a first violinist. The latter being done on a guitar made it that more stunning…and that barely scratches the surface of this grand design that Morris was building. The whole proceeding was one giant instant gratification after the next. I was exhausted after it was over…but like any good box of chocolates…you are going to return again and again. The replay attribute on this release is high. Grokking it all on one listen is futile. I’m looking forward to riding this wave again.